in support of the young people of our community. Stay tuned for dates, details, and how your son or daughter can participate. On November 4th, 2012 we held our 3rd Annual Fordham Lee Poffenbarger Basketball Round-Robin Tournament. 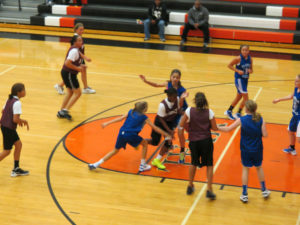 There were 8 (middle school aged) girls basketball teams in the tournament. Middletown JV and Varsity, Walkersville JV and Varsity, AAU Columbia Ravens, Monocacy JV, Oakdale JV and AAU Maryland Attitude. We also had a group of boys from Middletown who helped us out and filled in for a game, thanks boys. The teams played 3 games each, which helps get them ready for their upcoming basketball season and is for a great cause. Thank you girls and coaches and referees, we couldn’t have done it without all of you, excellent job. Events NOVA created the t-shirts for our event and sold custom shirts all day long, they also donated a percentage back to the FLP Memorial Fund. Wes Routzahn made this year’s awesome volunteer t-shirts and James Gang donated sandwiches and pizzas, thanks to each of you. We are happy to say that this year’s event was a HUGE SUCCESS! We couldn’t have done it without a lot of volunteers; we had 50 volunteers this year. To each and every one of you who donated, or helped out with whatever we asked thank you. This event is very special and the money donated goes towards helping deserving young adults, and helps keep Fordham Lee’s memory alive. Your support of the Fordham Lee Poffenbarger Memorial Fund enables us, in turn, to support worthy initiatives in our community. For more information about our scholarship program and charity bowling event. Donations are accepted by mail or PayPal. To contribute, mail a check to the mailing address below or use the below PayPal. Donations to the Fund are tax-deductible and any amount is welcome. Thank you!